As I belong to a very traditional family where dishes are still prepared from scratch and hardly people use any shortcut, I for a long time have detested getting a rice cooker. But if you are an working mother or have a very tight time schedule in the morning then you must invest in a good rice cooker. True that having rice without draining the water means getting more carb, but our bodies adjust ourselves with changing scenario. As rice cooker rice is more filling and tend to make one feel little heavy, your body will slowly adjust and you will find that you are satiated with lesser amount. Tilapia fillets are very popular here in USA. They are available everywhere at a cheap rate. We love Tilapia and regularly have it in India as this fish has very less bones and makes perfect for the kids. Here the fillets make my work easier and even my 17 months old can have them on her own without the fear of bones or skin in them. Only con is it's very soft to deal with. 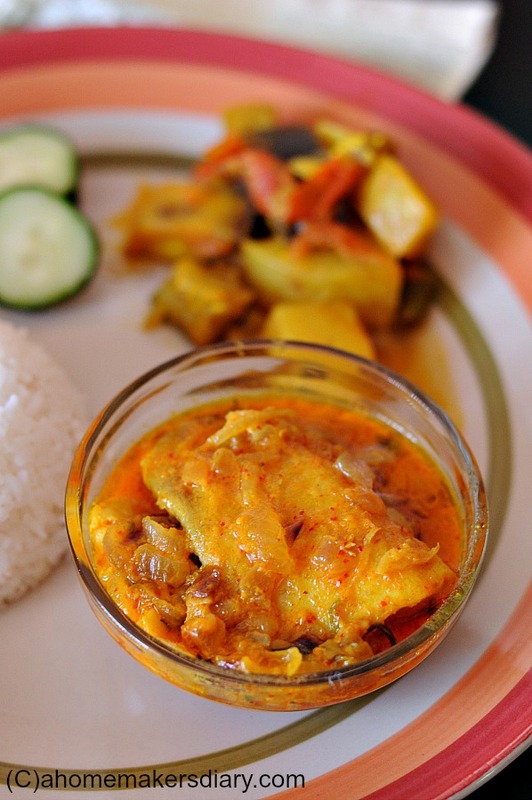 You need to be careful and use your spatulas very delicately to turn the fish or stir the curry. To harden them a little I marinate the fish pieces in little lemon juice.Also using a good quality non stick makes the work easier. 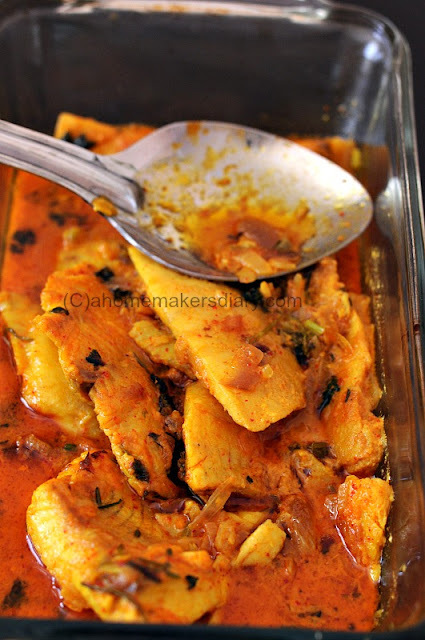 I cook this fish dish only with 3 tbsp oil but for this picture used 5 tbsp which I have mentioned in the recipe. Use less oil if you have a good flat nonstick cookware without the worry of sticking anything at the bottom. Cut the Tilapia fillets in half. and mix with salt and lemon juice if using. Use only a few drops. If it's frozen then best is to put in the fridge section to thaw overnight. A little planning really saves a lot of waiting time. Just make it a habit to chalk out your menu, shop accordingly to make things easier for you during the busy week days. Whip the yogurt till smooth. Add 1 tbsp oil, Chili powder, Turmeric powder, Ginger garlic paste and salt and whip to mix. Heat the oil and fry the fish fillets till little golden on each sides. Drain the oil and place in the yogurt mixture. Keep aside. Alternatively place them on a baking tray greased with oil and lined with baking paper or foil. Rub or spray oil on top of the fish and broil for 5 minutes. This tip is given a reader Nilanjana, This not only is healthy also will save your precious time. If you have a bigger oven it will also not require you to fry them in batches. In the mean time start frying the finely chopped onion in the same oil. Sprinkle a pinch of salt and cook till they are soft. Sprinkle little bit of water from time to time for cooking it quickly. Especially if you are using the large onions (not the Indian smaller ones). Cover and let the onion becomes soft and mushy for 6-7 minutes. Carefully put all the tilapia with yogurt in pan and mix with the onion. break the chilies and place in the gravy. Cover and let it cook for a minute and then pour 3/4 cup warm water. Cover and simmer on medium or low flame till the oil start to float on top. Chop and sprinkle the coriander leaves on top. mix and cook till you get the perfect consistency. Check for seasoning and adjust by adding salt, sugar or chili powder. Chop the onion very finely for lesser cooking time. Please adjust the heat by changing the quantity of chili as per your taste. Use yogurt that is fresh. Do not use tart yogurt for this dish. In Kolkata I prefer to use Homemade yogurt or The Nestle ones. The curd that comes in packet are not good for this dish as they have very high water content and way tart than the fresh ones. Non stick pan is a must if cooking fish here in the US. These days I am trying to cut back on non-stick pan usage but for fish, I still use it. Curry looks good. I can give you another shortcut which is healthy too. 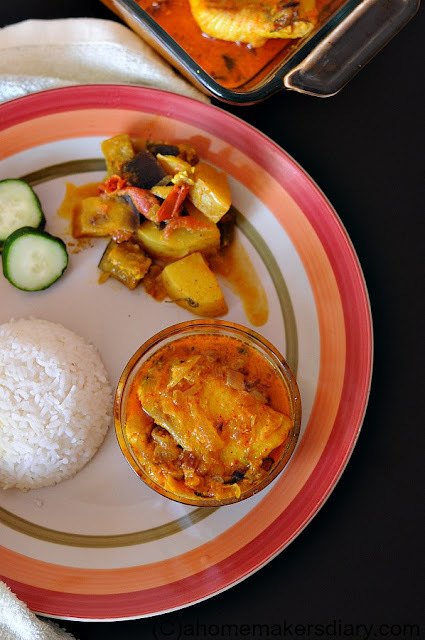 When I make fish curry here in US, instead of frying the fillets, i put them in a baking sheet smeared with salt and Turmeric and a little spray of oil. Then I simply broil them for 5 mins and they are ready to be dropped in the curry. You will find the Broil Settings in your oven. This way you can use a lot less oil. Also if you are making fish curry in a large quantity, you can avoid the hassel of frying the fish in batches. You can accomodate a number of fillets on a baking sheet. Also this way you will not have a fishy smell in your kitchen bcz here the open kitchens are adjoined with the living rooms and the smell of fried fish takes a long time to go away. Nilanjana, thank you for the tip yes very helpful. I sometimes do it for health purpose but never thought it is quicker too. will add this to the post. thanks again. Happy to help Sayantani. I am a very big fan of your cooking. Also since you are new to US, I will seriously recommend you to try the following fishes before you leave US. 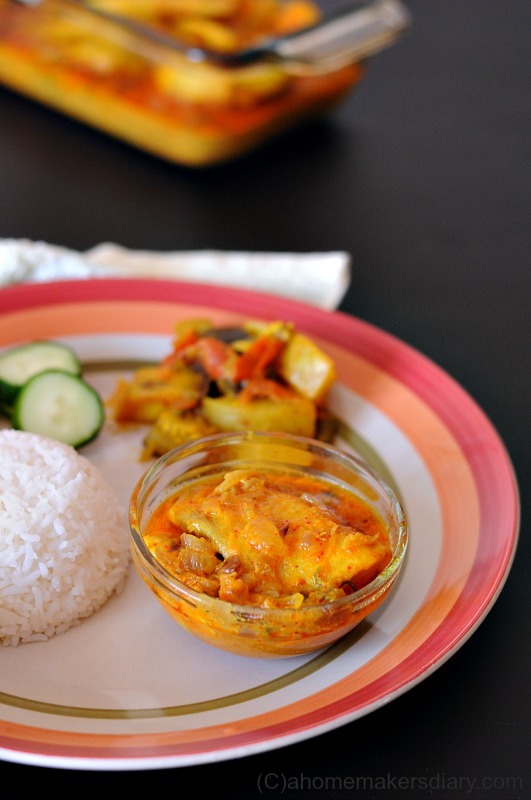 You can make Indian curries with them or simply grill or bake them. They are soooo good. Try buying these fishes from Whole Foods or Gourmet Grocery Stores. In Chicago area Olivia's Market is also very famous for their fresh fish collection. Lovely recipe! Try this with catfish fillets as well - those are firmer than tilapia and easier to handle. Instead of yoghurt, I use light sour cream as a substitute. It is creamy and less tart.